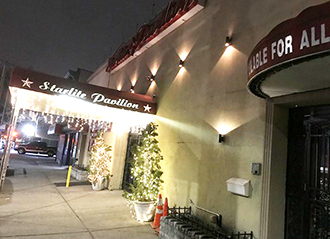 Starlite Pavilion is located in the Richmond Hill section of Queens, New York City and is easily reached via car or public transportation. Take Long Island Expressway / Grand Central East to Van Wyck South, exit on Atlantic Avenue service road, make right on 101st Avenue. LIE West, or Grand Central Parkway West Van Wyck Expressway South (towards Kennedy Airport). Exit on Atlantic Avenue, process south on service road to 101st avenue. Make right on 101 avenue to 130th street. Southern State Parkway to Belt Parkway, take Van Wyck Expressway North, exit on Liberty avenue. Proceed North on service road to 101st avenue. Make left on 101st avenue to 130th street. Verazanno Bridge to Belt Parkway East, take Van Wyck Expressway North, exit on Liberty avenue. Proceed North on service road to 101st avenue. Make left on 101st avenue to 130th street. LIE East or Triboro-Grand Central East Van Wyck Expressway South (towards Kennedy Airport),exti on Atlantic avenue, Proceed South on service road to 101st avenue, make right on 101st avenue to 130th street. Take Whitestone Bridge to Grand Central Parkway East Van Wyck Expressway South (towards Kennedy Airport), exit on Atlantic avenue, proceed South on service road to 101st avenue, make right on 101st avenue to 130th street. Take the Q8 from Jamica to 101st avenue and 130th street, walk two blocks to 101st avenue. A train to Lefferts Boulevard stop, then take #112 bus to 130th Street and walk two blocks to 101st avenue. J train to Lefferts Blvd. stop, then take #110 bus to 101st avenue, then Q8 bus to 130th street and walk two blocks to 130th street.